Pregnancy is an exciting journey. During this time, a woman’s body changes – her belly grows, and her chest and hip circumference increase. In what can seem like the blink of an eye, some of your clothes may no longer fit, and you’ll need pieces that are specifically designed for pregnancy. Maternity wear’s beginnings go all the way back to the Baroque period, when the first garment fashioned specially for pregnant women emerged: a coat-like dress with no visible waist and ample fabric folds. Clothes that were considered specifically for pregnancy weren’t widely available until the middle of the 19th century. At that time, the focus was on concealing the pregnancy. This trend persisted until the end of the 1960s, during which loose-fitting clothing was preferred. In the 1970s, the famous overalls were then incorporated into maternity wear. Today, many years later, women no longer want to conceal their pregnancy but want to proudly show it off while looking chic. It’s therefore no surprise that a large market for maternity wear that offers a variety of styles for the needs of pregnant women has emerged. The time when maternity clothes become necessary varies from woman to woman. This mainly depends on how quickly your body is changing and begins to store fat reserves. For example, most women opt for special maternity wear starting in their second trimester, while some prefer to do so earlier and others wait until the final weeks of their pregnancy. At the latest, it’s time to switch up your wardrobe when your normal clothes begin to feel tight. Many women think they need a bigger size during their pregnancy. Generally, however, your clothing size will remain the same. Suitable maternity clothes are tailored to give your baby bump enough space while fitting loosely around your chest and hips. 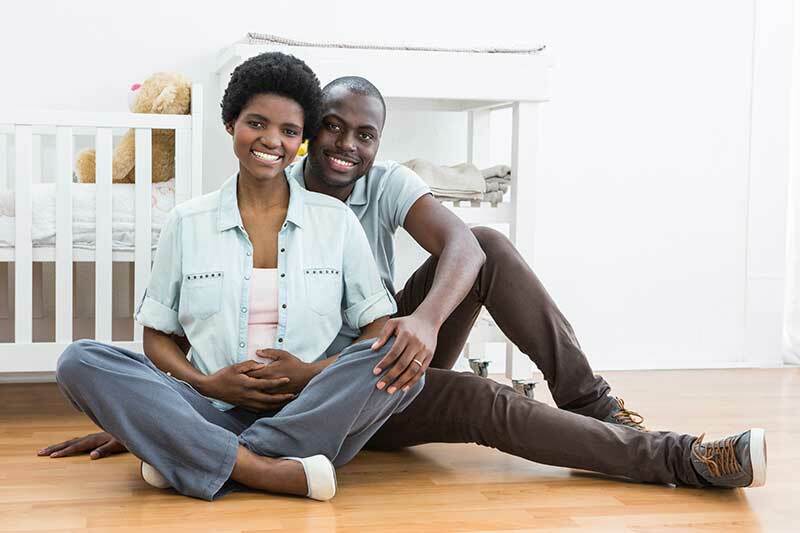 Since your body will continue to change throughout your pregnancy, it’s important to buy individual clothing items in stages rather than all at once. Overall, it’s recommended that you add to your wardrobe about every two months. Many online shops now offer special size charts that can help you find the right fit. If you visit a store, it’s best to simply try the clothes on to see what fits well. Maternity wear should be both chic and practical at the same time. It shouldn’t be too tight or too loose. If pressure is being placed on your stomach, it can not only be uncomfortable but downright painful. The important thing is that you feel comfortable in your clothing, so pieces made of fabric with a high stretch content are recommended. In addition, opt for clothes that have an elastic band rather than a stiff waistband. Maternity bands are also a good option to further adjust the width of individual items. 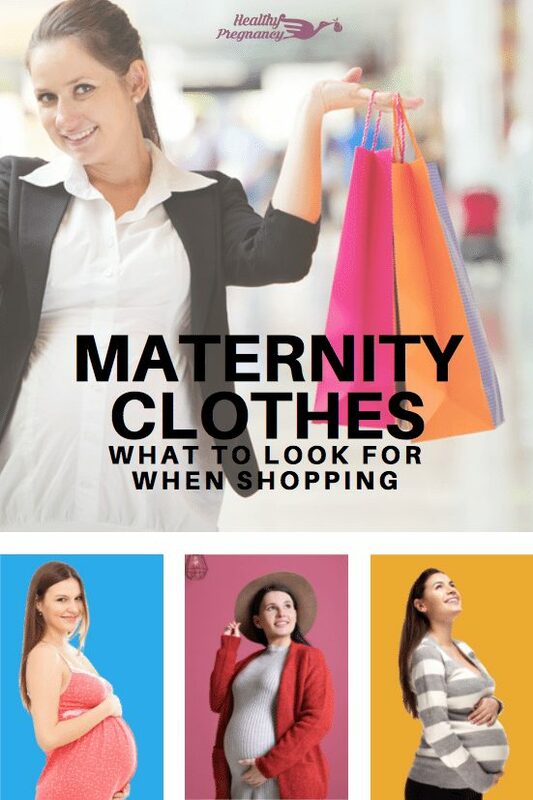 When buying maternity clothes, it’s important to select the right material. Light and airy clothing made of fabrics such as silk and cotton is especially recommended to help prevent excessive sweating. During the cold season, a layered look works best. When choosing colors, keep in mind that neutral and muted colors are more flattering than bright tones because the former have a slimming effect. When it comes to cuts, you should opt for A-line and trapezoidal shapes since these are flattering choices for a growing belly. On the other hand, it’s best to avoid empire waist and babydoll tops – these will only accentuate your bump. Long blazers and coats can also hide the first signs of pregnancy by concealing your figure. Don’t be afraid to get creative: Combine an ordinary pair of maternity pants with a sophisticated top or a chic blouse. With simple accessories, such as shawls, scarves and eye-catching necklaces, you can also distract from your baby bump while still looking stylish. If you’re looking for a different and cheaper alternative, you can simply take a look inside your partner’s closet and search for long and wide-cut button-ups, T-shirts and sweaters. In contrast to blouses, men’s shirts aren’t fitted at the waist, so they can help conceal your baby bump if you want. Another possibility may be to borrow maternity wear formerly worn by female friends or family members. During the first months of pregnancy, you’ll most likely be able to continue wearing your own bras by using an extender for your bra band. By the fourth month at the latest, however, you’ll have to update to a maternity bra. This should give your breasts plenty of support, have wide straps that don’t cut into your shoulders and be the right size. The advantage: A maternity bra will give your skin the additional support it needs to help you avoid unsightly stretch marks. A maternity bra will also take strain off your back. Last but not least, these bras are extremely comfortable since they’re specially designed for pregnancy and made of soft materials. If you don’t want to buy a maternity bra, you can always opt for a sports bra that doesn’t constrict you and offers ideal support by perfectly adjusting to the size of your breasts. Starting in your 8th month, it’s also helpful to purchase at least two good and comfortable nursing bras without underwire (this can cause blocked milk ducts). When selecting underwear, make sure that it has a soft and stretchy waistband. You can find stylish maternity clothes online at pinkblush, bellybutton, hotmilk, Seraphine, nestlingco, apeainthepod, Motherhood, and mybellamama.